For nearly two weeks in 480 B.C., a massive Persian army numbering as many as 300,000 troops was prevented from invading Greece by a small band of dedicated Greek warriors, heroically led by the Spartan King Leonidas at the Battle of Thermopylae. Despite being numerically superior, the Persian force was hemmed in by unfavorable geography (which the Spartans used decisively to their advantage) and were therefore unable to dislodge the Greek defenders from August 20 until September 10 of that year. That is, until a Persian force managed to make it to higher ground and rain down death upon the Greek defenders. The capture of the high ground was the coup de grace that the Persians needed to defeat the tiny, but unflappable contingent of Greek defenders at Thermopylae. Since the dawn of history, the military force that came to dominate the strategic high ground usually won the battle. Today, space is the ultimate strategic high ground. 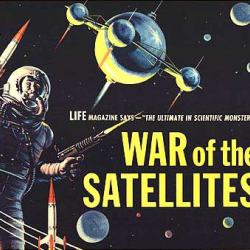 As such, he who controls the strategic high ground of space controls the world. Click over to American Greatness for the rest of the article, please!